Guess who has a tooth??? And since he is number 5, the tooth was fully out before I noticed it yesterday. That and the fact I wasn't expecting a tooth for another month or two. Product Review: R & R Games FLEA CIRCUS!!! For my first review of the new homeschooling year I am happy to introduce: R&R Games Flea Circus! This game is designed for 2 to 6 players ages 6 and up. Players compete with colorful game cards to try and attract the most cats and dogs to their personal circus shows. Act fast because once the cards run out the circus shows are over! The player with the most points (cats are worth one, dogs are worth two) is the winner. The boys got right down to business with the game. It includes a handout to explain what each card means and how it is played. It was essential to have this easily accessible because there are a lot of cards that have special uses. Stacking your earned animals became an important part of the game. "I think this game needs more cat and dog pieces." What did my pint-sized judges think of the game? "I liked it the first couple times I played it." "I liked it! I liked the cards, how each of them were a different point. I also liked the pictures on the cards, they were kind of funny and kind of weird." "It was very fun because you weren't forced to put down certain cards and it was fun how instead of checking points or each thing being one point, dogs were two points and cats were one point. I also enjoyed playing with the dogs and cats." The game is compact (making it an easy addition to your overcrowded game shelf) and the cards are well-made, sturdy, and colorful. I found the directions to be fairly straightforward; my only difficulty being that there are so many cards that do something besides earn the number of points shown. That got to be a bit confusing. Overall playing time was ten to fifteen minutes, and it is a smaller game, making it a perfect item to take into waiting rooms and restaurants. I would also like to point out that although the recommended age was six and up, Margaret enjoyed playing the game with her brothers and she is three and a half. A true family favorite game! 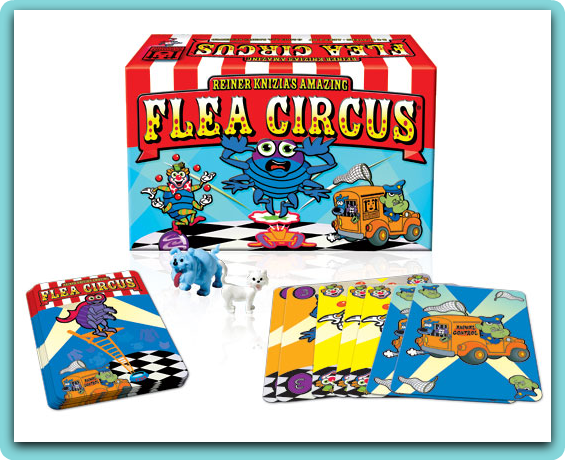 Flea Circus can be purchased from the R & R Games Website for $15.95. Check out their website to see a wide selection of games including party games and games for your family game night! Use the coupon code CREW20 to get 20% off any purchase for the rest of the year. I think I see some new games under our Christmas Tree! Disclaimer: As a member of the TOS Homeschool Review group, I received this product free of charge in exchange for an honest review on this blog. I received no other compensation. Happy First Day of School 2011 !!!! August 28 was Malcolm's first Feast day! Baby Kimono top~ not for etsy. Completed Blue Knights garments. Two of the ten are completed. I am a big advocate of starting solid food when the baby is ready, not when the doctor/baby book/grandparents/etc. say you should start them. That said, Malcolm is the youngest of my children to start solid foods. I noticed that he just wasn't himself lately. Unusually fussy, sleeping less, and waking frequently in the night to nurse. I waited a couple days nursing him as much as he wanted. When the thrill of being the human pacifer wore off, I went to buy some rice cereal. At this stage it is so watered down that it looks like hazy water. James even said, "We're feeding him water?" He didn't know what to make of it the first day. He didn't really eat it and instead played with it on his tongue. As with any new Malcolm event, all the kids were present for this big change in his diet. He had started to figure things out by the second day and was smiling and cooing at James in between spoonfuls. 1. Soccer has started. Isaac goes on Thursday and Saturday. James on Tuesday, Friday, and Sunday. We've had one day and so far so good. 2. We start schooling on Monday. James in 5th, Isaac in 2nd, and Henry in 1st. And yes, we normally have a month done by the start of September. 3. Malcolm had his first solid food. I have a whole blog post about it that I forgot to post. Cute pictures! He had it for a few days, but then had a rough day of upset tummy and so now he is back to breastmilk only. And he is sooooo much happier. 4. After much thought I decided to take a year off of our homeschooling co-op. We just have so. many. activities. that I needed to free up some time. I mean homeschooling implies being at home. Which we really weren't doing very much of. I am hoping to be able to return to it next year. The kids are taking it better than I am. I am wondering if I made the right decision. After all, I get to see my friends there too! Michael: "When were you a baby?" Margaret: "When I was in Mama's tummy." Michael: "How did you come out?" Margaret: "I went to the doctor." Michael: "Why did you come out?" Margaret: "I wanted to grow." 6. I am currently reading The Help by Kathryn Stockett. Have you read it and did you love it? I am really enjoying it so far! 7. And speaking of reading...Did your kids do the Barnes and Nobles summer reading club? Mine did for the second summer. We are going tomorrow to collect our free books. Of course, going to get free books at a book store means I'll probably be spending fifty to a hundred dollars. Anyone else have that problem at book stores? We had a little mishap at our most recent party when our proch swing fell down. Thankfully now one was injured. This event prompted Michael to check out what was behind our metal and plastic siding that was covering the underside of our porch roof. It doesn't look that great, but with a little TLC and some paint I think it'll be great. And it wouldn't be like us to just take a little peak. After all, if you're going to go ahead and do something, might as well make it worth it. Never mind the fact that Michael begins teaching again in a week... Working never stopped him before! My weekly offering for etsy. 1. Today is my mother-in-laws birthday! 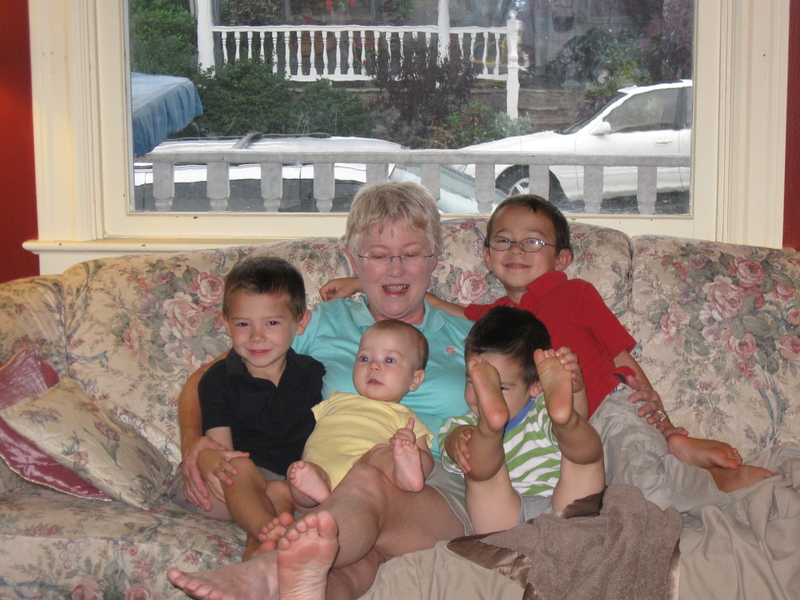 This is my most recent group photo of her and the kids and it's from 2008! Time for some new photos. 2. I took the kids to a free dance lesson earlier in the week. I have decided that I really dislike the whole dance mentality around here. The studio we went to was chosen because we got some free coupons. They advertised a "stress-free" environment; it was anything but. There was no class for Margaret because the teacher was on vacation, but the director allowed her to dance in the same class as the boys. That class was an hour and a half. Margaret lasted just under an hour. Totally fine with me! But when the boys left the class they got a treat. Margaret got no treat because she left the class early. Margaret started crying and the director egged her on by saying, "How much do you hate me now?" Then proceeded to tell me that I may think it is mean, but it is how she trains them to stay in the class the whole time. Almost in the same breath she explained that the three year old class was shorter and more age-appropriate. So is she punishing Margaret for leaving the class or for being in a class that wasn't age-appropriate? The boys were described as"disruptive" because they kept dancing and smiling at themselves in the mirrors. Ummm. The whole place was mirrors. And I watched the class, they followed orders, I mean directions, better than some of the whiny girls in the class. I don't need a graduate degree to see when we aren't wanted. But if you don't want to honor free coupons- DON'T PASS THEM OUT!!! Lifevests by the front door ready to throw in the car for a swim at the lake. 4. One more week until we "officially" start schooling. That's when the public school goes back, and also when Michael beings teaching. We have tried to start schooling before the public school starts, but it doesn't really work since the neighbors go to school. It's hard for my kids to concentrate when their are other kids playing in our yard with our yard toys. 5. We are all ready for school. Even Henry who was recently whining about how much school a first grader has to do. He whined yesterday, "I wish we could start school nowwwwww." 6. I got behind on my diaper washing and had to borrow a diaper for Malcolm from the neighbor while mine were drying. She only had a size three and it fit him perfectly. Sigh. It's going by so fast. James won some free passes to the Heinz History Center, so we headed out there this week to check things out. It was a wonderful interactive museum. It was so large we only saw part of it! Today was Margaret's Feast Day. After Liturgy and a free dance lesson (more about that later), she got to open her presents. We always store the presents on top of the bookcases and Margaret has been longing for these for about a week now. and in the location she thought it should be! Then she had to try the dress with a new hooded towel. When that dress got boring she had to put on other dresses. A day filled with presents, new dresses and a new tea set that you and your brothers play with is a good day indeed! New items in my etsy shop this week! 1. Michael has finished painting the school room this beautiful blue color with the Ivory trim. As many of you suggested, more storage was needed for this room. Well, IKEA had what we wanted, but Michael dislikes IKEA. All that stuff about creating a disposable lifestyle. So he decided to build me a cabinet in the schoolroom. It will eventually have doors, but we are waiting for some special saw so that he can make them fancy. It is beyond fabulous. 2. Okay, so Michael may have missed his calling. I was whining about how the bookcase I wanted to put in the hallway was too large for the space. The boys weren't able to really open the door to their room with it there. So Michael busted out a bunch of leftover wood pieces and built me this bookcase in the hallway. It is way better than the one I wanted to put there and holds a ton of books. It still needs to be painted, but I was going crazy with thousands of books on my sewing tables and had to get them put up. 3. Since our school room is out of order our dining room currently looks like this. And no, we aren't doing any school work. I wish! 4. This is my awesome new phone. I need a good place for it. I am thinking about putting it in my awesome new school room. And no, that is not my number. 5. My Mama sent me this photo collage I made when I was about twenty. It's fun to look at although I can only remember the names to about half of the people. 6. Do these bookcases look awful or what?!? I took the nice, wooden bookcases from the living room and switched them with the cheap ones in the school room. I cringe every time I enter the living room now. I guess Michael is going to need to whip up a couple of built-ins for this room as well. 7. I saved the best for last! Malcolm meets the family cow. If you are not familiar with our family and the cow, watch this video to see Margaret meeting the cow. I don't have a good video of Malcolm with the cow, but I hope to post one soon. How was swimming lessons today? New in my etsy store!